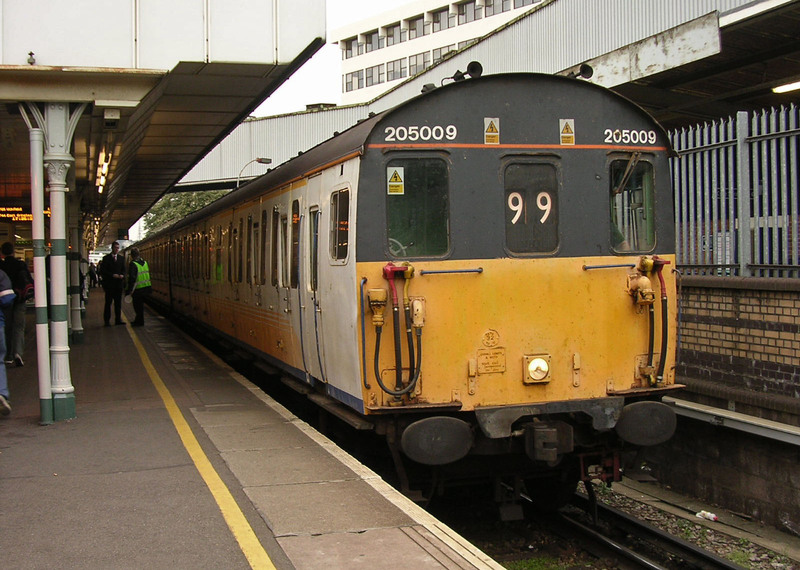 A conversation at work in the last week turned to 'Thumpers' - the SR DEMU's which plied non-electrified lines from the late 1950's right up until the mid-2000's. 205001 on the blocks of platform 11 with stock for the 17:10 to Uckfield. 4-VOP 3917 occupies platform 10. 24/09/2004. 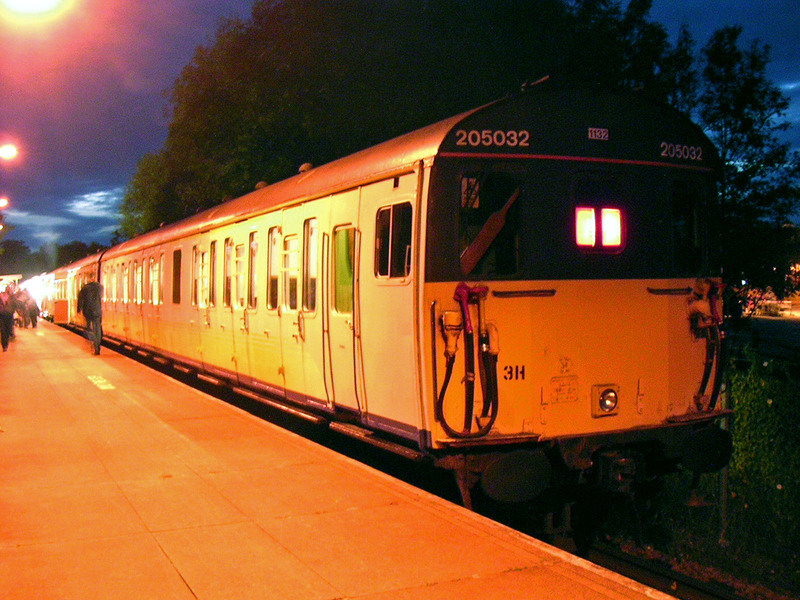 I caught only the very end of these distinctive units mainline careers; discovering them on one of my early outings in 2003. I went for a run on the two routes which were by this time the final stomping ground of the class 205 and 207, Oxted - Uckfield and Hastings - Ashford. As well as these fairly rural services (which were some way from home) there were two workings each weekday peak into or out of London. Due to the price of a peak travelcard (a large consideration back then, even on child fares!) 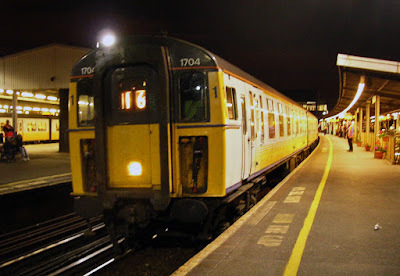 I never covered the inbound runs from Uckfield to London, however the evening runs, the 17:10 London Bridge - Uckfield and the 18:02 Victoria - Uckfield (Later 18:12 London Bridge - Uckfield) became a regular way to spend my evening. I missed plenty of other trains in the process- but quite frankly at 17:00 on a weekday if I was out there was only one place I would be and that was at the end of the high level platforms at London Bridge waiting for the inbound 'Thumper' ECS. Friday 24th September 2004 wasn't a normal day for the Thumpers. Or in many ways it was. This was the *last* normal day for the Thumpers out of London. From the following Monday the new class 170 'Turbostars' would take over the peak trains, having already replaced the Thumpers on the branches. This was the last booked day of the Thumpers- and I wasn't going to miss it. I headed up to London Bridge after school and by the time I arrived and met my friends the ECS for the 17:10 to Uckfield was already sitting under the LB&SCR Roof on platform 11 formed of 205001 and 205009. Both the London peak trains were booked to be formed of 6 coaches, but regularly turned up as 5 car formations (and occasionally a very cosy 4!). 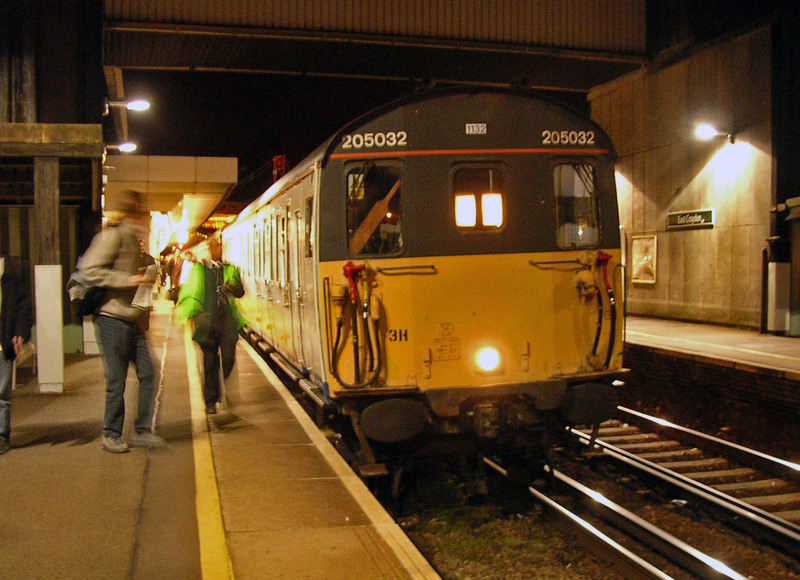 205001 was one of the 2-car units technically dedicated to the branch duties. 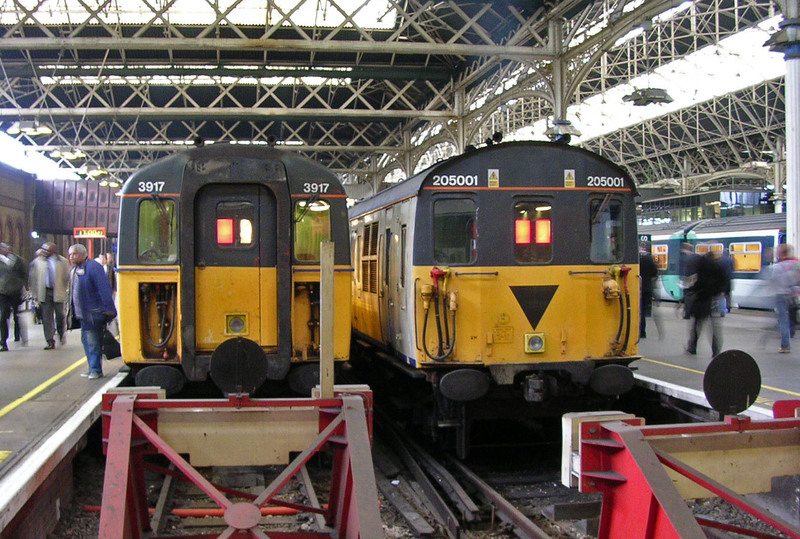 The train was formed up with the 'triangle end' power car of 205001 at the buffers and the power car of 205009 the same way round, with the non-powered trailer leading. 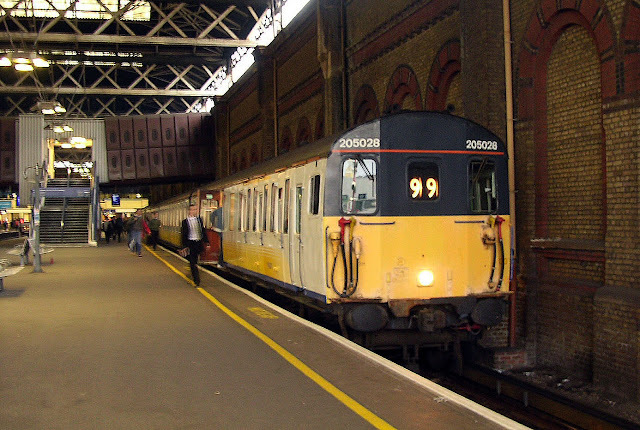 The train was even busier than normal with enthusiasts who had come to say goodbye to the ancient DMU's so we ended up travelling in the guards van of 205009.
arrival with the last scheduled service from London Bridge. 24/09/2004. At East Croydon, as was usual, we left the Uckfield train. Something must have gone wrong at this point as it was usually possible to take a 'Slammer' back to London Bridge (often a VEP via Crystal Palace if memory serves me correctly) to make the 18:12 departure, but on this occasion my photos reveal we travelled on a 455, possibly to make sure we didn't miss what could have been the very last train. Whatever the reason for the 455 we overtook the ECS stock at Norwood Junction and arrived into London Bridge in plenty of time to see 205032 and 205028 arrive for the 18:12 to Uckfield. This train used platform 9 and before long (and after taking many appallingly blurred photos!) we boarded the power car, both of which were in the middle, of 205028 for the full journey to Uckfield. 205028 was one of the units I had seen comparatively little so it was good to get a further run onboard. It was unusual to take the train beyond East Croydon (and out of Travelcard territory) but this was a special occasion. Furthermore Southern who operated the service at the time had agreed to run the ECS from Uckfield to Selhurst in service to East Croydon (the earlier peak train was booked to return in service, but not the 18:12) in order to appease the enthusiasts, and get us home! 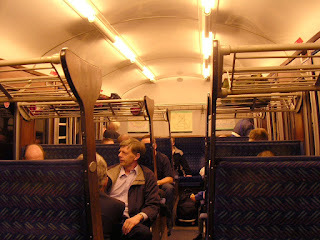 The run was noisy as ever on the crowded train- windows were wide open and heads were out (those 2-piece window bars never were very effective!). 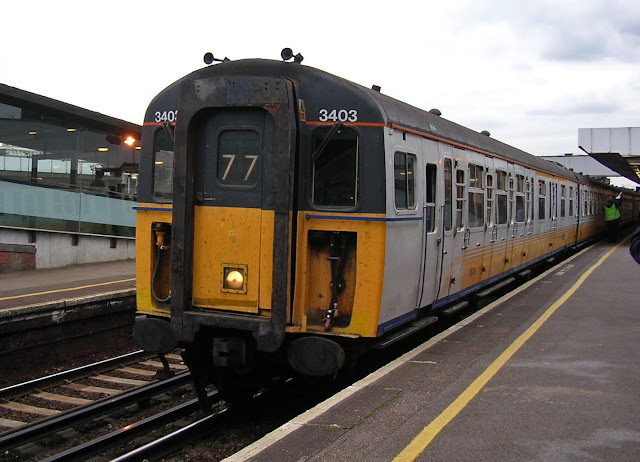 It was always fun riding this train, but it was fair to say this occasion was tinged with sadness knowing that we may never again fly down the mainline to the sound of two 4-SRKT English Electric diesel engines on non-corridor stock from a different railway era. The interior of 205032 on the return 'special' to East Croydon. difficult to imagine traveling in a train looking like this today. At Uckfield some enthusiasts climbed onto the front of the unit and adorned it with stickers of its old number, 1128- a practice that definitely wouldn't be permitted today, and in all likelihood probably wasn't in 2004 either! Many photos were taken of the train, possibly the last 6 car to reach Uckfield in normal service- I distinctly remember one chap with what can only be described as a floodlight taking his photos of 205032 on the London end of the train. To say that the driver was not amused would be an understatement. Maybe Southern had failed to inform him that this was the last run of the Thumpers. Certainly he was even less amused when the gathered enthusiasts informed him that he was taking us back to East Croydon in service. A few phone calls were made to control and much to his dismay he was indeed in service back to Croydon non-stop. Here a final photo call was made before the assembled enthusiasts with much jollity savored the final English Electric departure to the depot. That was the end of scheduled Thumpers on Southern and the end of non-corridor stock. Fortunately the 'slammers' were still going strong at this point and the evening wasn't quite over with 'phase 1' 4-CIG 1704 being enjoyed to Clapham Junction. The Phase 1 units were always a particular joy to travel on with the additional headrests on the seats and some compartments even still featuring string luggage racks! Of course this didn't quite turn out to be the final run for the Thumpers- several units were kept available to cover for unavailable Turbostars for several more weeks and I had one more ride with 205028 and 205032 in regular service less than a week later on 30th September- this pair covering the 17:10 while 205001 and 205009 worked the 18:12. That occasion however was to be my last mainline run besides the public farewell tour on 27th November 2004. It is hard looking back to think that it is now over a decade since the Thumper Farewell - certainly penning this article brings back some fond memories. Thankfully all bar one of the final Southern units were preserved, and with the exception of 205028 which lies out of use and damaged at Meldon Quarry all of the units in use that day can still be enjoyed in preservation.